^ "Defense.gov News Article: Trainers, Advisors Help Philippines Fight Terrorism". Archived from the original on July 14, 2015. Retrieved 29 June 2015. ^ "About". NDFP. Retrieved 2018-07-11. ^ "Rebels own up raid on Japanese fruit exporter in Mindanao". The Manila Times Online. January 24, 2014. 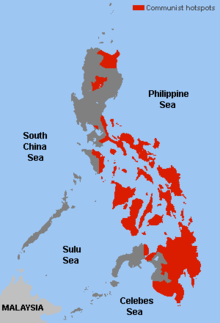 ^ "NPA Rebels Own up Deadly Attacks in Philippines; Vow to Strike at Plantations, Mining Firms". Earth First! Newswire. March 12, 2014. ^ "King Of Ore: Despite Nickel Asia's Raids, Zamora Did Not Retreat". Forbes. August 26, 2015. ^ Logico, Michael (Jun 27, 2014). "Failed NPA attack at Mawab". YouTube. ^ Capistrano, Zea Io Ming (February 1, 2016). "NPA says Bukidnon plantations raze done to stop "destructive" expansions". Davao Today. ^ Ballaran, Jhoanna. "Duterte declares CPP, NPA as terrorist organizations". Retrieved 2017-12-06.